High speed printing : approx. 3.1 line / sec. Highly reliable 9-pin print head. EPSON TM295 / TM290 compatible with same size footprint and interchangeable power supply, easier paper & ribbon loading. Please click here for Catalog Download Service. Catalogs, manuals and software can be downloaded. 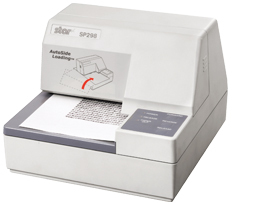 Star Micronics provides specification manuals, technical manuals and others.